If the combination of Ren Fair-style roleplay, classical theatre, and scavenger hunting sounds intriguing to you, then the Surrey Arts Centre’s presentation of Slumber Here is an experience you shouldn’t miss. 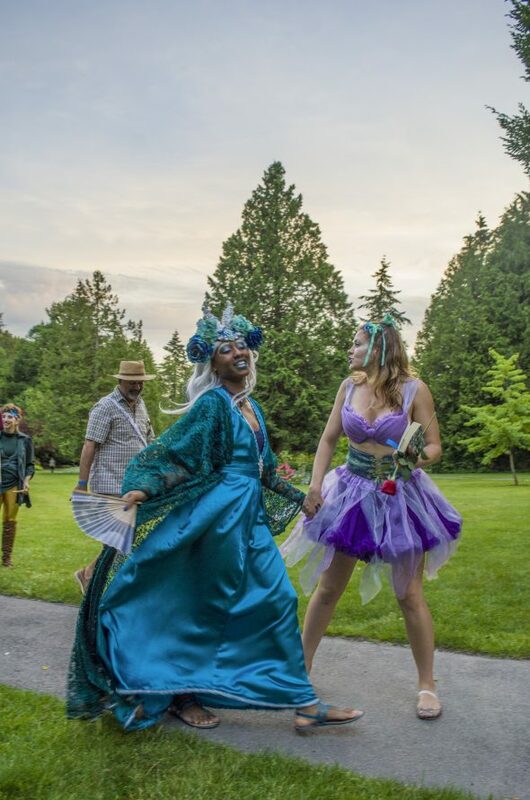 The production is an interactive, choose-your-own-adventure-style take on Shakespeare’s A Midsummer Night’s Dream where the audience is encouraged to take on the roles of the play’s protagonists. Slumber Here was brought to Surrey by playwrights Farilith Harvey, Ryan Caron, Chelsea Stuyt, and Andrew Lynch. It was written to cater to fans of both Shakespeare and narrative-driven games like Skyrim and Fallout. Originally, Slumber Here ran as part of the Vancouver Fringe Festival last fall, so moving the show to the much larger venue of Bear Creek Park changed its dynamic. 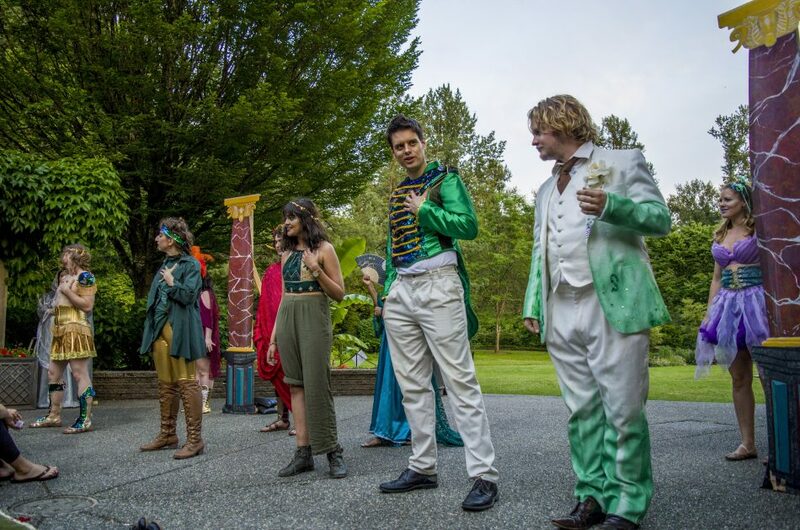 “We were invited by the Surrey Arts Centre and their arts programming to remount the piece here, and we were really thrilled to expand the show into this beautiful park,” says Ryan Caron, the co-artistic director of the theatrical company, The Geekenders. According to Caron, running the show during Fringe helped make it what it is now. For the team working on it, he says that it was a fun challenge to move it to the idyllic gardens of Bear Creek Park. Harvey, whom the other directors referred to as “The Queen Nerd”, is credited with being the main advocate for applying the choice-centric story structures of video games to theatre, a trend which she says is “very in vogue right now.” In order to achieve this, the directors aimed to encourage both the performers and the audience members alike to role-play through the performance. As the general manager of Instant Theatre in Vancouver, Stuyt is well-versed in the practice of long-form improv. During the hour and fifteen minutes I spent in the park for Slumber Here, I found a piece of Calliban’s heart to set him free from golden chains, aided Peasblossom the fairy in getting her voice back with the help of Francis Flute, stole a teardrop from the fairy Queen Titania for use in a spell, had a pillow fight with Puck and his posse of fey hooligans, and “married” a complete stranger. The directors of the production all agree that, if given the chance, they would definitely like to run Slumber Here in the future.